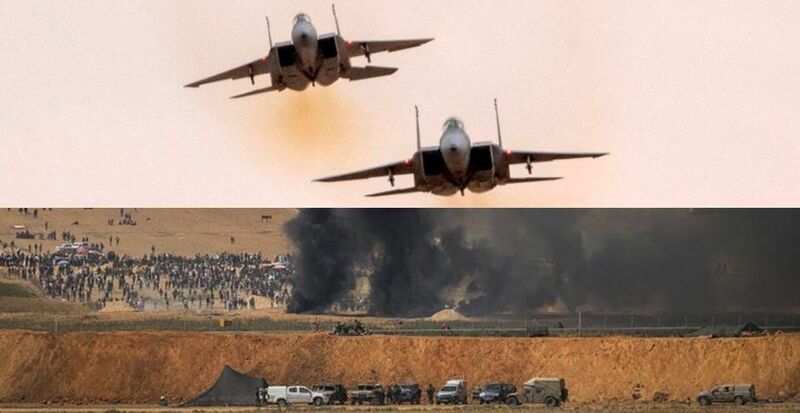 All Israel’s security branches, the air force, military, emergency teams and firefighters are on top preparedness against Hamas’ threat to outdo its former record of violent ourbreaks on June 8, the last Friday of Ramadan. Iran too has proclaimed the date “Jerusalem Day.” Israel intelligence has learned that the extremist Hamas has called on all fellow Palestinian terrorist groups to muster the largest “demonstration” ever to attack the Israeli border fence, and out-perform the bloody onslaughts of the last two months. Hamas has warned that if any members of the Palestinian mob suffer injuries from Israeli fire, rockets will be fired instantaneously – not just on Israel communities near the border but on targets in central Israel. The IDF responded to the threat Thursday night with a rare communique marking the end of a large-scale, week-long Israel air exercise, which practiced combat on three fronts, Syria, Lebanon and the Gaza Strip. The drill wrapped up with simulated attacks by scores of Israeli fighter jets on terrorist targets in Gaza. The communique came with a video-taped interview with one of the commanders of the exercise. He disclosed that the warplanes taking part in the drill had remained on a state of high readiness, armed with heavy, high-precision bombs for multiple simultaneous strikes. They were held ready to go into action the moment the Palestinians launched their first rocket against Israel. SET ALOFT BALLOONS CARRYING INSECTICIDE OVER THE MUDSLIMES AND THEN HAVE DRONES SHOOT THEM DOWN. Oy vey! Always mit ze gaz! The BS this guy talks is to thick you can cut it down in bricks and build a sanatorium for all the crazy pricks like him. Uhuh…in that case it should be so easy to refute without resorting to cowardly ‘ad hominem’ projection fantasies. I’m waiting. All your Jihads will continue to turn into millions of Nakbas! If iran attack israel, israel will need help because they can’t fight in 4 front (not 3) at same time. Really, I didn’t know that that the IDF, and all their well proven missile systems only work in one direction at one time. Yeah. These people are hilariously stupid. If Hamas fires missiles into Israel, take the casualties and send tanks into Gaza. Immediately field execute ALL Hamas terrorists for war crimes. Finish the job and withdraw. Do NOT let in any NGOs or press (for their own protection) until 2 years after the operation has concluded. Finish the job and DO NOT WITHDRAW but take back all the land of Gaza, and as soon as the furst West Bank Arabs start a commotion go in there full bore and take that land back too. Oslo was a huge mistake, Gaza and all it’s people need to be retaken and obliterated as they have shown their true colors from the day ISRAEL turned Gaza over to them. It must never be that any population in Gaza can hold hostage the people of ISRAEL by rockets and kites and tunnels. Time to kick over the table and rewrite the “rules” so the Gaga me ends with a lot of dead Arab carcasses rotting and bloviating in the hot Mideast summer sun, food for circling vultures and feral dogs and cats. Greg song! I am whistling it right now! He does not need anyone, he will launch the tactical nuclear bombs .. if a fundraiser is opened, we will start many! I hope they’re on guard against Iranian attacks also. Israel has multi-layered missile defense systems. These systems are on all the time and kick in automatically as required. Not being stupid, but countries have been known to leave backdoor borders lightly guarded. It happens. Have a read about the Arrow system. This system worked automatically, even in the early stages. It is battle tested and ready to go. Are these News.?.. I thought.. Israel is going to blow up Damascus. Or thereran .. but Gaza… don’t make me laught gaza..
IDF are just waiting for them to turn up with some more new gear. The last lot of new gear got broken. Arik Sharon committed a great error when he ordered the pull-out from Gaza. In the midterm there is no other choice than march in and clean the stripe from the terrorists. If one were uncertain or plain stupid to think that Islam is like all other religions, just look how they react during Ramadan; they get super violent during their “religious” festivities. Islam is a violent way of looking at the world which asks believers to conquer the world and that is a problem for all of us. Hopefully Israel won’t have to waste precious bullets on the palestinian and gazan thugs. Only they would turn another religious holiday into a riot. Vermin. Minimum 2/3 of all he dead and wounded are from fire from the back.